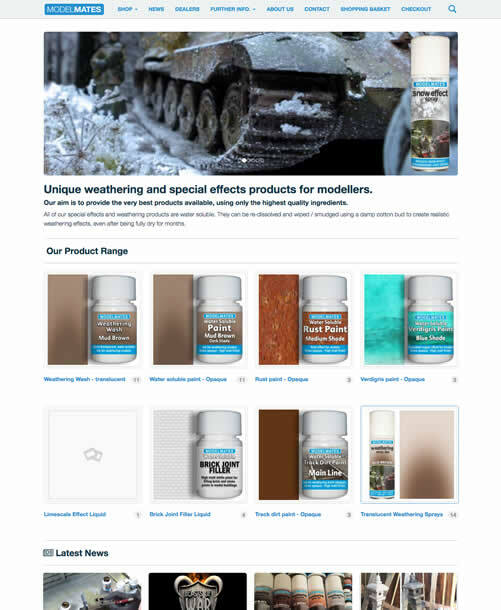 Model Mates is an ecommerce website powered by Woocommere and WordPress. This website was built on the Nudie theme in partnership with Sink140. The aim of the website was to redevelop it to make it easier for the client to maintain, as well as adding greater functionality. We added custom sections to allow out client to offer video and written tutorials on how to use his products. We also imported their blog on to the new website and made sure that no traffic was lost in the process. The website colours were chosen by the client to coincide with his logo and branding. He wanted a simple design with easy navigation to benefit his customer base who are not as computer savvy as others. The layouts are all very simple and flow well, allowing the user to find exactly what they are looking for with ease. Model Mates is completely responsive to mobile devices, ensuring that all mobile traffic benefits and has a great user experience. Since more people are buying with their mobile devices, a website has to make sure that this process is seamless. We built into the Model Mates website a dealers directory so that our client could also list all of the places people can buy his paint. While the purpose of the website is to generate sales, showing that his products are sold worldwide is highly beneficial. Little touches like this add credibility and increase trust between the first time buyer and the brand. It helps that the Model Mates products are some of the best paints available, and have been used in Hollywood films! Adding to the blog and ecommerce Model Mates also has a vast array of information available for users who want to know how to use the products. This kind of content not only helps to boost engagement and sales but also helps a website to rank better in Google.